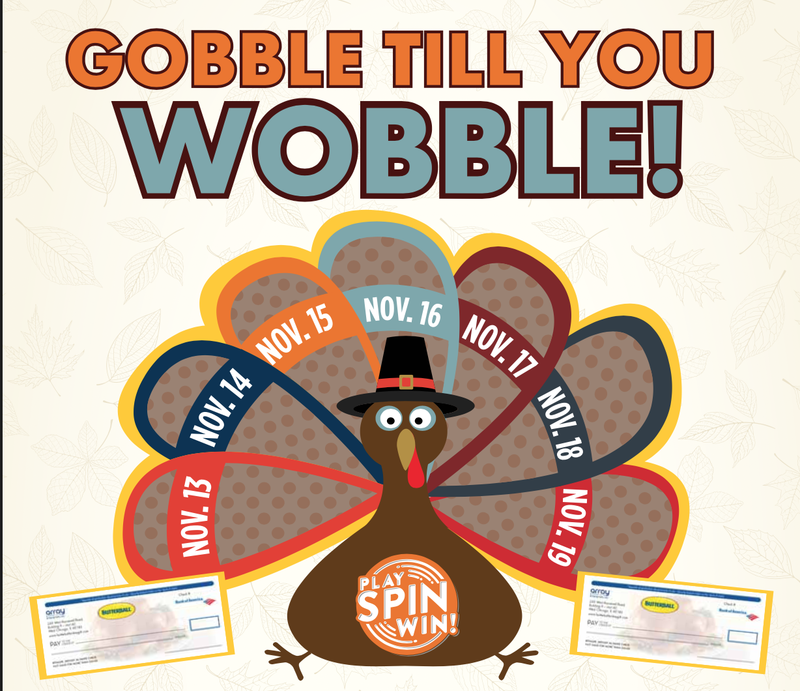 PROMOTION OVERVIEW: The 2018 Gobble ‘til you Wobble Drawing Giveaway (the “Promotion”) will be available at all Stella’s Place and Shelby’s locations. These gaming cafes/restaurants operate under the ownership and management of Laredo Hospitality Management, LLC, with video gaming provided by Gold Rush Amusements, Inc. (“Gold Rush”) and Illinois Gaming Investors, LLC d/b/a Prairie State Gaming (“Prairie State Gaming) (“Sponsors”). The promotion starts Tuesday, November 13, 2018 when such Gaming Café opens and ends Monday, November 19, 2018 at 7:00pm when the final drawing is completed. 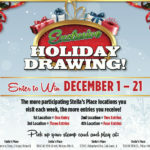 The Gobble ‘til you Wobble Drawing Giveaway will allow guests who come into a Stella’s Place/Shelby’s to receive one entry card per person, per day, per location to be entered in the daily drawings. Guest must provide name and phone number to qualify to win a $20 Butterball Gift Check. 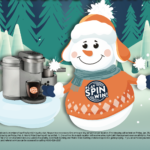 From Tuesday, November 13, 2018 – Monday, November 19, 2018, each location will draw two (2) winners each day at 7:00pm. Guests can win one (1) prize, per day, per location, but can win multiple days throughout the promotional period. Winning entries will not be put back in the drawing entry bowl. Entries in the drawing entry bowl will not be emptied and will remain in the drawing entry bowl for the duration of the promotion. Guests do not need to be present to win. PROMOTION DATE: The “promotion” will begin in all participating Gaming Cafés on Tuesday, November 13, 2018 when such Gaming Café opens that day and ends on Monday, November 19, 2018 at 7pm (After the completion of the drawing). 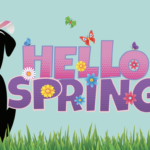 Two (2) names will be drawn each day (Tuesday – Monday) at 7:00pm by a Laredo Guest Service Host and the winners will receive one (1) $20 Butterball Gift Check. CONDITIONS: Prizes are not transferable. One (1) entry card per person, per day, per participating location. Not responsible for lost or stolen Butterball Gift Checks. Customer may purchase Butterball Turkey products or other grocery products, at a participating store, with the $20 Butterball Gift Check. Butterball Gift Checks cannot be replaced if lost, stolen or destroyed.